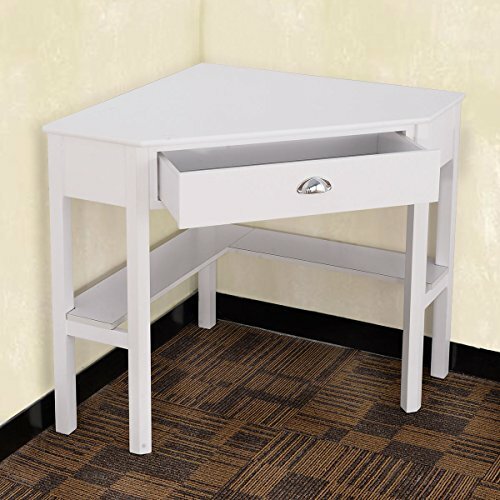 Tangkula corner computer desk will fit snuggly in corner to maximize your home office space. Design of the corner desk is classic and there is enough space to hold computer, laptop, books and other office supplier. The construction is stable and the surface is smooth and easy to clean. This corner desk will company you for years. Don't hesitant to buy one! All necessary hardware is included. We packed all the parts as good as we can, but if there is any part missing or damaged, plz feel free to contact with us and offer us pic of damaged part, we will reship it to you at no any charge to you or give you some discount. Standard Shipping: There is only 1 box. And our warehouse is in America. You will get the lovely item in 3-6 Business days via ups or usps. Experience Customer service team will quickly solve any doubt for you with patience and smile in 24 hours via email.Welcome! 【Package & Shipping】There is only 1 box. All necessary hardware, tools and instruction are also included. The corner desk is in America. UPS will take the package to your home door in 3-6 Business days. 【Customer service & Guarantee】With our clear manual, it's easy to assemble. If there is any questions plz feel free to contact with us, our experienced customer service team will response in 24 hours. We packed this desk as good as we can, if there is any part missing or damaged during shipping, please contact us first and offer us pictures of damaged part, we will solve the problem as the way you want(replacement at no charge or discount).